OFF-ROAD LIVE ! 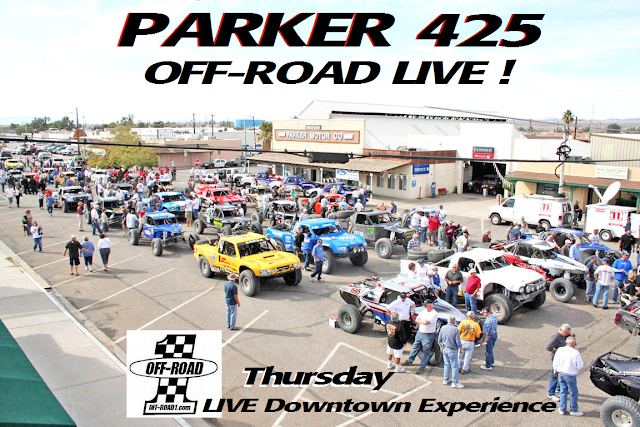 : LIVE PARKER 425 2017 OFF-ROAD LIVE! LIVE PARKER 425 2017 OFF-ROAD LIVE! ANDY McMILLIN TSCO TOYO TIRES WINS PARKER 425 2017! LIVE! ANDY McMILLIN WINS PARKER 425 2017 LIVE! CLICK HERE RaceDay Start! LIVE! OFFICIAL Top 20 qualifying results for Best in the Desert Parker 425 Time Trials. 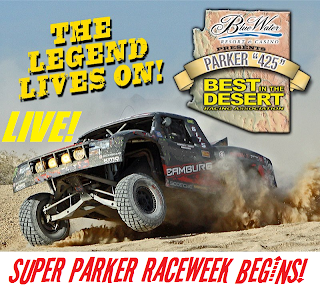 The SUPER PARKER 425, Our ONLINE Coverage! 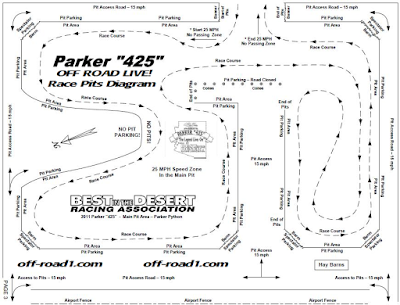 The Parker 425 is a Historic Desert Off-Road Race. The Official OFF-ROAD LIVE! Modern History of off-road racing in the area dates back to 1971. However, these were not the first races here. 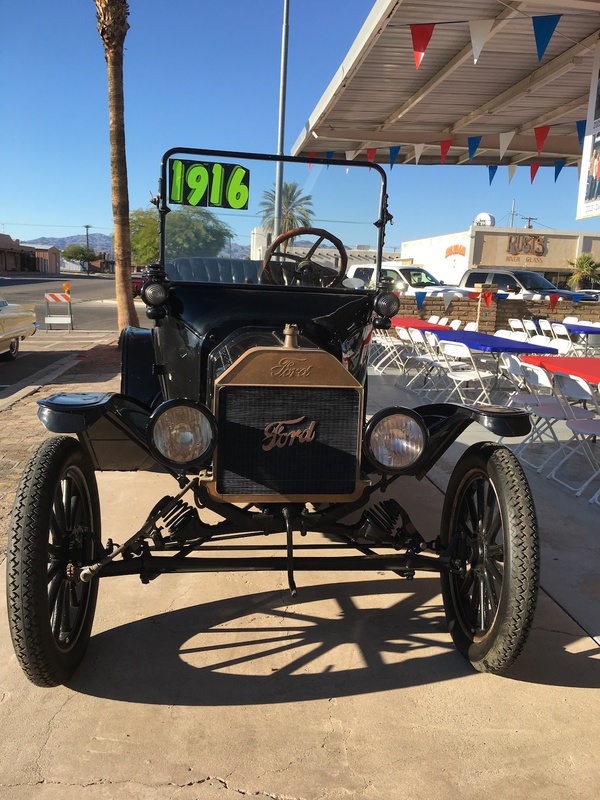 During the 'pioneer days' of off-road racing in 1911, one of Parker's leading pioneers, Joe Bush, staged a race from Parker to Wenden to promote his ferry service across the Colorado River. In 1916, a cross country road race from Los Angeles to the Arizona State Fair, named 'the Desert Classic', included a stopover in Parker. The drivers stayed at Joe and Nellie Bush's Grandview Hotel. Participating in the desert classic event that year were Billy Hutt, Louis Chevrolet, Harold Bell Wright, the Great Barney Oldfield and Ralph Hamlin. Joe Bush accompanied the group as far as Wenden and was ahead of the field after approximately 80 miles. The year 1974 saw a new name, the Parker 400, and a new promoter: Short-Course Off-Road Enthusiasts International was founded in 1973 by the late Mickey Thompson. Thompson's 'SCORE' had many "firsts" in his racing career. He was the first American to top 400 mph on the Bonneville Salt Flats, the first to use lights to start drag races and one of the first to recognize the potential of off-road racing as a truly international sport. In the 1990s, SCORE moved the event to Laughlin, Nev. The Parker race was operated for a time by Whiplash Motorsports. They introduced starting the race in downtown Parker, and also created “The Gauntlet,” a collection of jumps and dips designed to delight the spectators. BITD created a similar feature with the Parker Python in the main pit area. 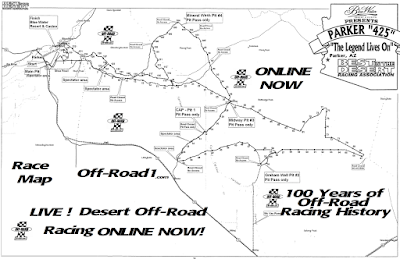 Best in the Desert Racing Association (BITD) has promoted and organized the Parker race since 2003. During that time, the event has grown in size and many of the big names in the sport that were here when SCORE ran the event have returned to Parker. OFF-ROAD LIVE ! will supply the fans of off-road recreation today and RaceDay on Saturday LIVE-ONLINE streaming coverage of ALL the action. NOW! at the Blue Water Resort & Casino and Saturdays race coverage will commence at 6 AM Saturday morning with LIVE screaming unlimited power trucks flying off the start-line at Noon, local time! More than 200 of the worlds best off-road racers have signed up for the 2017 running of the Blue Water Resort & Casino Parker 425. 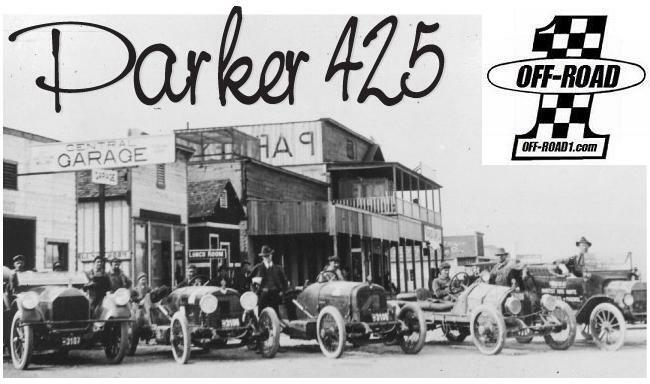 Parker Mayor Dan Beaver made a statement at the January 17 Parker Town Council meeting that the Parker 425 will go on as planned, which would have been the desire of the late founder of Best in the Desert Racing Association, Casey Folks. Folks passed into Off-Road Racing history last month. Casey Folks, the founder and President of Best in the Desert Racing Association, died the morning of Jan. 12 in Las Vegas after suffering a massive stroke and being airlifted to Vegas the morning of Jan. 7 in Parker. He was in Parker for the annual Parker 250 off-road race for motorcycles, quads and UTVs. Folks spent almost his entire adult life in the off-road racing world as a competitor, promoter and friend to the off-road racing industry. He raced motorcycles from age 21 to age 45. He won 16 championships in his career. In 1980, he was the first to Ironman the Baja 1000 and finish. He was also the only competitor to finish every Barstow to Vegas race. In 1968, Folks opened Sportsman Cycle Sales in Las Vegas with his friend, Tom Scales. It grew into one of the top motorcycle racing shop in Vegas. Several racers had their careers start and were nurtured there. In 1988, Folks turned the business over to his eldest son Daryl so he could focus on Best in the Desert Racing Association. 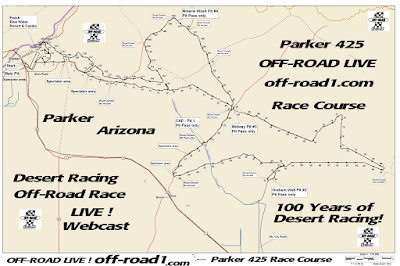 RaceWeek of the SUPER PARKER 425 starts on OFF-ROAD LIVE! at 4pm Monday, January 30. 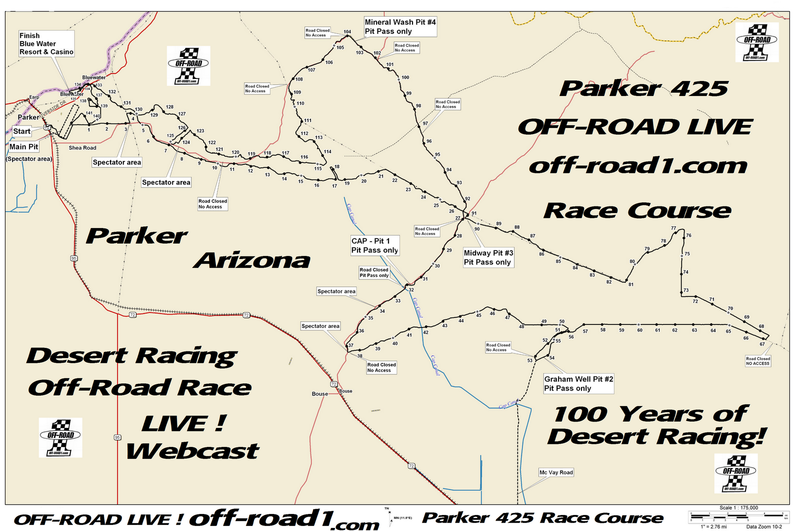 The Parker 425 race is scheduled for Feb. 2-5. The BlueWater Resort & Casino Parker 425 presented by Impact, to give the event its full name, is one of the premier off-road races in America. It traditionally brings some of the biggest names in off-road racing to Parker. This marks the 44th year that the city of Parker has hosted an off-road race along the great Colorado River.The weekend gets started off on Thursday with the high speed action of the traditional Best in the Desert Time Trials, where the starting order is determined for the two fastest classes, Trick Trucks and Class 1500. Following Time Trials, the race trucks and cars will be escorted to the center of town for the 2nd annual Parker Downtown Experience. Last year thousands of Parker area residents, racers and fans gathered for the afternoon with live bands and a collection of the worlds fastest and most technologically advanced off-road race vehicles on display. Contingency gets underway Friday morning in the north parking lot of the Blue Water Resort & Casino. Thousands of spectators and race fans are expected and will have the chance all day long to get up close to the race vehicles and drivers as they weave their way through the hundreds of manufacturers and vendors set up on display. The 2017 edition of the BlueWater Resort & Casino Parker 425 will again feature a staggered 2-start format beginning Saturday morning, February 4th. The day’s first start will stage at 5:00 AM at the “Parker Python”, adjacent to the main pit located just outside downtown Parker. This group of race vehicle classes will then start the race, beginning at 6:00 AM. Some of these classes will compete for two laps, with the remaining classes running three laps. This first start will feature a Gran Prix Finish, which means when the overall leader receives the checkered flag, all others crossing the finish line after that will also receive the checkered regardless of how many laps they have completed. The second start of the day will feature the Trick Truck class, along with classes 1500, 6100, 7200 and 8000. These racers will stage at 12 noon at the “Parker Python”. From there, they will be escorted to the starting line located on California Ave. in the middle of downtown Parker. The winner of “Time Trials” will get the solo green flag start at approximately 1:30 PM with the rest of the field starting two at a time after that. All of these racers will compete for three laps. The finish line for all race vehicles will be in the parking lot of the BlueWater Resort & Casino. 2017 RACE COURSE DISTANCE/DETAILS~ The Parker "425" is 427-miles for three (3) lap classes and 272-miles for two (2)lap classes. 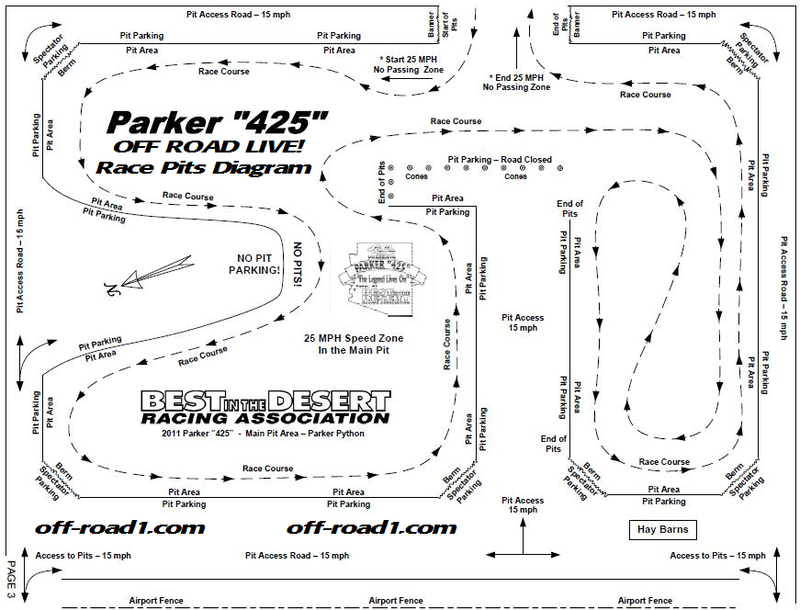 DESIGNATED PITS~ There are four (4) pits out on the course, plus one (1) Main Pit in Parker.Start to Pit 1 = 29 miles (RM 29), Pit 1to Pit 2 = 23 miles (RM 52), Pit 2 to Pit 3 = 37 miles (RM 89),Pit 3 to Pit 4 = 13 miles (RM 102), Pit 4 to Main Pit in Parker = 46 miles (RM 142).